﻿So you think you can fly? Join Dunai! 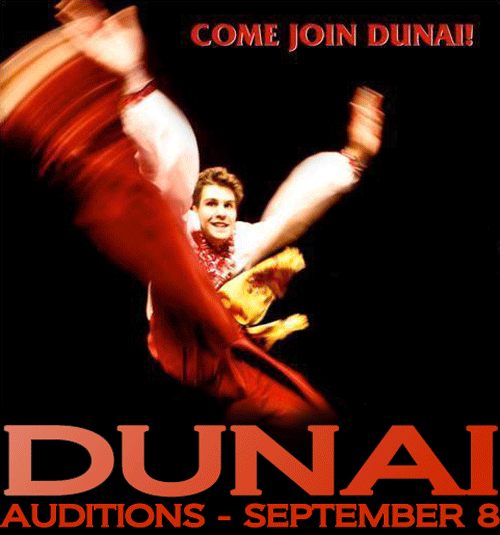 The Dunai Dancers of the Verkhovyna Ensemble will be holding auditions at 6pm on September 8, 2011 at the Ukrainian Youth Unity Complex Gymnasium. The complex is located at 9615-153 Ave. Edmonton, Alberta [MAP]. Males 14yrs+ and females 16yrs+ are welcome. For more information, contact Breanne - 780.919.2485.